With 2014 being a year dominated by astounding releases from countless Extreme bands, a little Melodic Metal goes a long way. Italy is a country that has never failed to impress me with its pool of Metal bands; KALIDIA is a new, female-fronted Power Metal quintet, with plenty of Gothic and Symphonic tendencies; perhaps think back to the old NIGHTWISH and KAMELOT material. "The Lost Mariner" begins the album as one of its strongest tracks, brimming with strong keyboards. It is adventurous in strongly-melodic leaps and bounds; as I expected, it is dominated by keyboards and vocals, capitalizing on strong, evocative atmosphere. Nicoletta's vocals are powerful, and unexpectedly non operatic, opting for a more traditional approach to melodic metal singing, a voice comparable to Brittney of UNLEASH THE ARCHERS or Kim of SYNERGY. This is perhaps what makes the album stand out, other Symphonic albums dominated by high-pitched wails. 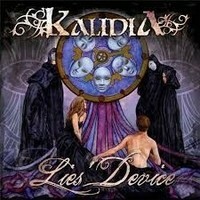 If I could make an even stronger connection to KAMELOT, it would be through the track "Reign of Kalidia", with melodic progressions strongly evocative of the "The Fourth Legacy" – "Karma" years. One of my favorite tracks, the vocals effectively combine catchiness and melodic technicality, and the riffs have a prominent, exotic vibe about them. The album's title track is decidedly moving and airy, full of liquid, effortless grooves. It becomes decidedly more powerful as it progresses, containing a variety of imaginative licks and hooks, going all the way back to early STRATOVARIUS and progressing with amorphic ease. "In Black and White" is likely the strongest point of this album, carried into battle wielding strong and wailing, drawn-out melodies, and easily one of the album's heaviest, grandest tracks; all four minutes scream "epic". Even the vocal presence reaches a peak on this track, though perhaps owed to the greater overall expression of songwriting. It is no small wonder that a country known for its creative arts, especially its music, would go onto produce excellent metal bands. "Lies' Device" is a remarkably strong venture for a new act.